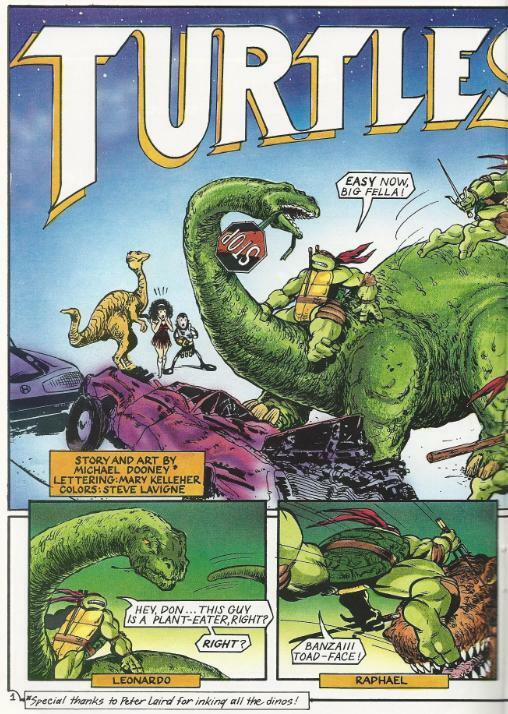 As Mikey, Don and Raph struggle with the hungry T-rex, Leonardo enjoys a leisurely ride on the back of a brontosaurus (while a confused struthiomimus dashes off). Donatello groans to himself, as he thought he’d gotten enough of fighting dinosaurs when he and his brothers visited the past. Meanwhile, Betti is worried that the “nice turtle monsters” are going to get eaten. Henry assures her that he can figure his time gauntlet out and send the dinos back where they came from. *This story is continued from Teenage Mutant NinjaTurtles Attack!!! Part 1. The story continues in Teenage Mutant Ninja Turtles Attack!!! Part 3. 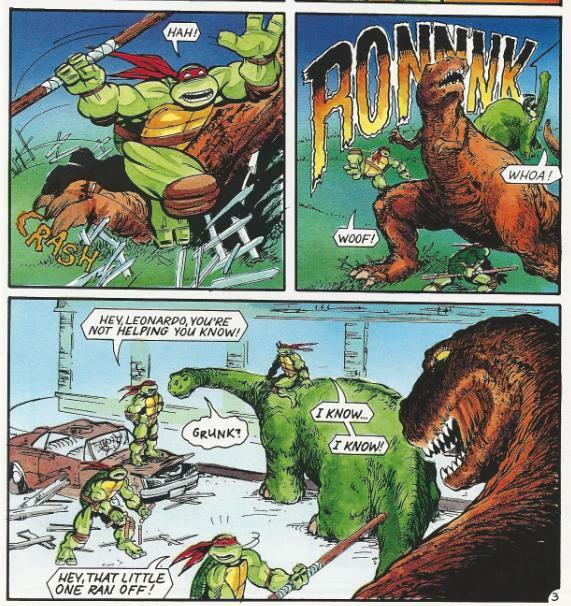 *Donatello references the time they fought dinosaurs in the past with Renet in Tales of the TMNT (Vol. 1) #7. Okay, so I’m just sort of guessing that the tiny yellow dinosaur is a struthiomimus. I’m no paleontologist. Maybe it’s a gallimimus (you know, those things from “Jurassic Park”). The only reason I even suggest struthiomimus is because Phil Tippett did stop-motion animation for one in a dinosaur documentary that I watched endlessly as a child. The one hosted by Christopher Reeve. C’mon, you know the one I'm talkin' about. Anyway, more fun stuff. My favorite part in this segment of “Teenage Mutant Ninja Turtles Attack!! 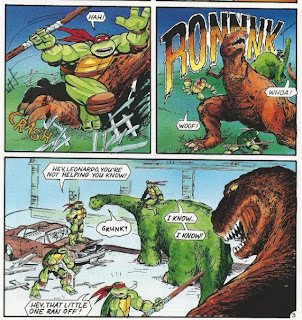 !” is the panel where Raph scolds Leo for leaving the T-rex to his brothers while he goes for a horsey-back ride on the brontosaurus. One of the better things about Michael Dooney’s stories was that he understood that even dishwater-dull Leonardo liked to have fun every once in a while. Leo’s segment of “Challenges” gave a nice spotlight to that quality. And, I mean, honestly: When is he going to get an opportunity to ride on the back of a brontosaurus again? Laird’s inking on the dinosaurs definitely stands out as Laird’s style of inking and not Dooney’s, but I wouldn’t say it clashes, either. It does have the effect of making the linework on the dinos look less “Dooney-ish”, though. I read these for the YouTube links. Thank you very much for putting a name on my early childhood memories. Them's some real nice looking dinosaurs. Oh man, the alternate universe Phil Tippet stop motion "Jurassic Park" that exists in my head is SO awesome.